Quantity: 1 crate (24 pints) yields 24 frozen pints.1 pint yields 1 frozen pint. 1. Harvest fully ripe, firm, well-colored berries. 2. Remove those that are immature or defective. 4. 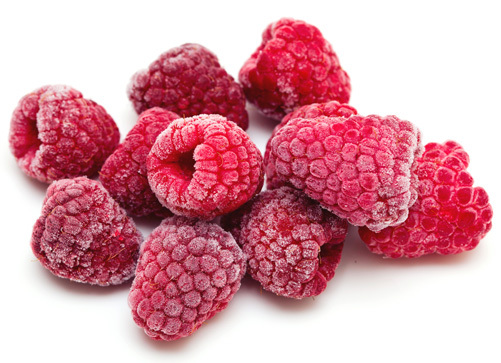 Pack raspberries into containers, leaving headspace, seal and freeze, or follow directions below for style of pack desired. Syrup pack: Pack berries into containers and cover with cold 40 percent syrup, leave headspace, seal and freeze. Sugar pack: To 1 quart (1-1/3 pounds) berries add 3/4 cup sugar and mix carefully to avoid crushing. Stir until most of the sugar is dissolved. Pack into containers, leave headspace, seal and freeze. Unsweetened pack: Tray freeze; then pack berries into containers, leaving no headspace, seal and freeze.